The True Strength Life podcast is hosted by Aaron Simpkins and has a Monday-Friday Daily Words of Wisdom show that discusses a verse or passage from the book of Proverbs. Also included occasionally will be interviews, and thoughts on different topics including culture, business, and life etc. True Strength Life comes from the brand True Strength Apparel which exists to encourage people to discover that True Strength for life only comes from knowing Jesus Christ as Lord and Savior. God exists, Jesus is God and the bible is God's word so we take it seriously. Since yesterday was Resurrection day aka Easter, I’m posting this lesson I gave at my church last year at this time on the Evidence for the truth of the Resurrection. Same bad speaker but same true info that won’t change. I am only skimming the surface on this by the way so if you wanna look more into the evidence then look into work done on the subject by guys such as Gary Habermas, J Warner Wallace, Lee Strobel, William Lane Craig, Craig Hazen etc. Special Sale for 100th Episode! 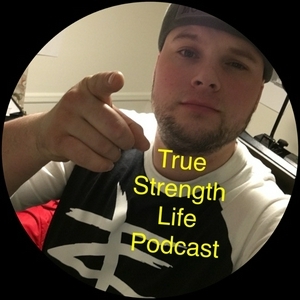 As a way to say thank you to everyone for the support of this podcast we are doing a 25% off sale for 1/14/19 just use 100podcast during checkout at TrueStrengthApparel.com! Thank you everyone! Back to the podcasting game after about a month off with no real updates for you guys on why 😬 my bad. There's a super good reason though I promise! Wanted to share my challenge I've had with actually picking up the Bible and reading it. Do you? Hang it up or Keep pushing?